This week is a big one for us at EMBASSY. It marks one year since the launch of this site. To some people a year may not be that long but to us it’s a benchmark to be proud of. Although the year has flown by were stoked on the feedback and comments we’ve gotten over the past year, and look forward to many more years ahead. A huge thanks goes out to everyone who helps make this site what it is, our sponsors and advertisers, and lastly a huge thanks to everyone who checks the site regularly. Thank you! For our one year anniversary we decided to team up with Quintin (who else makes hats as good as these dudes?) to do a limited edition anniversary hat. 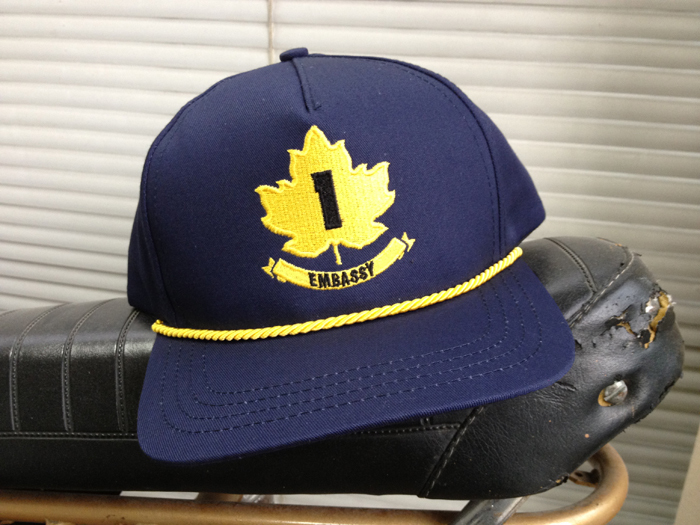 We wanted to incorporate an image that most Canadian riders could recognize. The Trans-Canada Highway (or Highway 1) is a road that most BMX riders have driven on at least once. The fact that this highway spans from one end of the country to the other represents what we at the Embassy wish to achieve with this site, a link for Canadians from coast to coast. The hats are available on our online store and also at 3Ride and BMX Gallery, and are limited to only 50 pieces. They are $30, get one while you can! Along with our one year anniversary, we have a big week ahead with a few big features starting Monday. Check back soon! Lastly a huge thanks to Quintin for helping us get these hats done in time, these guys know whatsup. Check out their winter line here.